A hard dormant prune is a must to produce of heavy plant. There are few problems with this shrub. It is low maintenance, has nice bark, and isn't prone to pest problems. 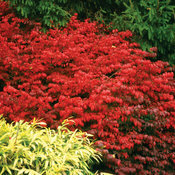 However, to maximize the fall red foliage color, the plants should be placed in full sun. Plants placed in areas with too much shade will color up much later in the fall and will often lose their leaves before they have a chance to turn bright red. Tolerant of most soils except extremely wet conditions. pH adaptable. Prefers medium moisture. Deciduous shrub. Fertilize in early spring by applying a slow release fertilizer specialized for trees and shrubs. Follow the label recommended rate of application. Fertilizer will prime the plant to have a good growth flush in spring to its maximum potential. Withstands heavy pruning. Can be done whenever, but best done in late fall. Burning bushes are very heavy feeders. If the leaves are less than 3-4 inches in length and a light green then increase your fertility.